AKA Chorizo Sisig. You hungry now? 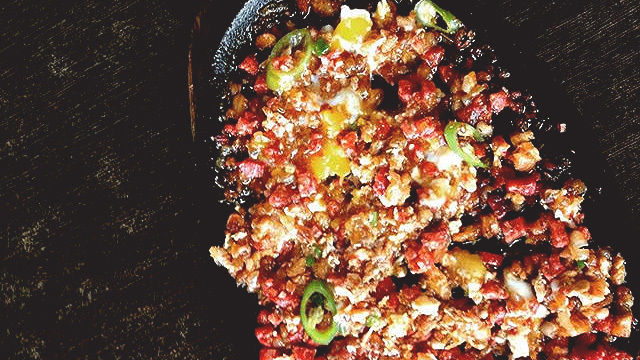 Before you go on your Lenten break, indulge us one last time with this week's entry: Chorisisig! The chorizo adds a smoky touch to this classic pulutan. Beer is optional, but extra rice is definitely a must! 1. Place the pork mask, one-fourth-cup chopped onions, half-tablespoon garlic, bayleaf, and peppercorns, and water in a stockpot and boil until the meat becomes tender but still a bit chewy. If you’re using a pressure cooker, cook the pork for 30 minutes. 2. Remove pork from the stock and rub it with sea salt. Let it dry out. 3. Get three-fourths of the dried pork mask and grill it until the meat turns slightly brown and develops a smoky flavor. Chop it into cubes. 4. Deep-fry the remaining pork mask until crisp, and crumble it into pieces. Set it aside. 5. In a pan, sauté the chorizo, onions, garlic, and chili. Sprinkle it with a pinch of paprika, and add in the chopped grilled sisig. Cook it for one to two minutes. 6. Remove the pan from the fire and mix in the mayonnaise, liquid seasoning, calamansi juice, and chili. 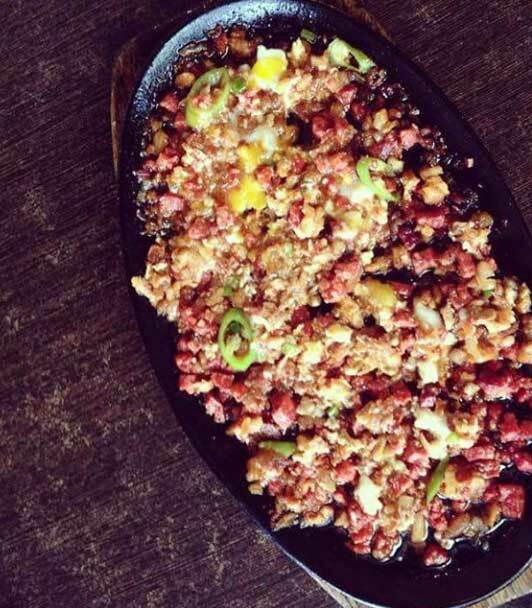 Serve it on a heated sizzling plate and top with the crispy sisig meat. 1. Egg! 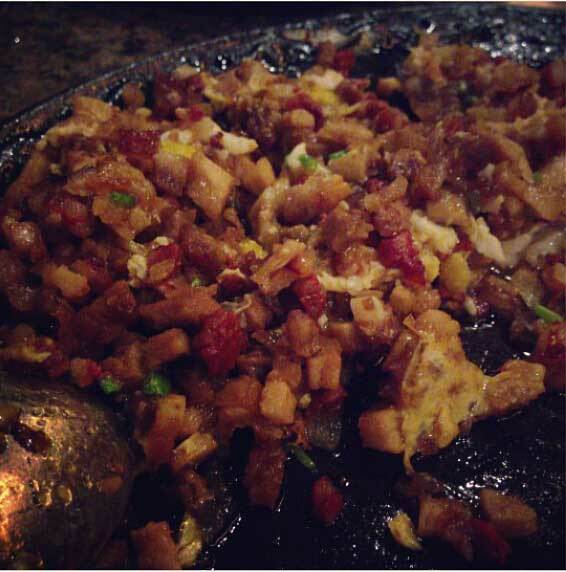 Any self-respecting sisig fan knows adding egg is a must! 2. 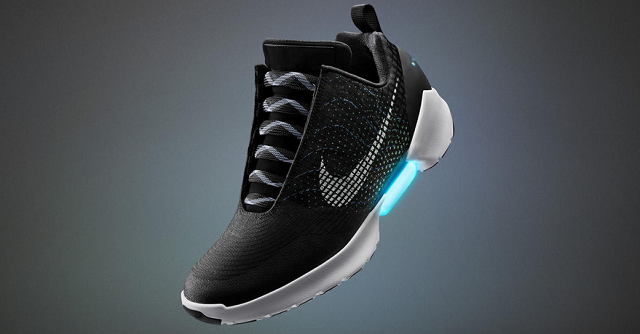 Looking for something little more sophisticated? Try making buttered toasted bread slices as a side dish. 3. A few slices of fresh lettuce also add more crunch to the whole package. 1. If you're serving this dish with a heated sizzling plate, make sure to mix it constantly to avoid getting burnt meat. 2. Squeamish about eating a pig’s face, or clueless about where to get it? You can substitute it with liempo.